Home » Ancient Aliens Debunked? What do you think?? Few pseudo scientific ideas have captured the imagination like ancient astronaut “theory”. The idea has become almost it’s own religion as it often uses religious myth as a source of so-called evidence. Assisting its popularity is a host of documentaries including a series called Ancient Aliens specifically dedicated to the ancient alien hypothesis (hereby referred to as AAH). In this thread I hope to dissect the first episode of the History Channel show Ancient Aliens in an effort to more or less debunk the claims presented. My hope is that this attempt will further discussion and get those who believe in AAH to take a closer look at what they believe and why and what they are prepared to call evidence. I hope that everyone will take the time to watch the video either before or during reading. I am going to describe much of what is talked about in the video in an attempt to make viewing it non-essential however. This is gonna be a long one folks. After the intro they begin by introducing Erik Von Daniken, author of Chariot of the Gods. He talks about the inception of AAH and how he scoured religious texts from all over the world. Daniken than says that no matter where you go the story is always the same. God’s descended from the heavens. The problem is that not all mythologies involve the gods descending from the Heavens. Daniken is taking the myths out of context. And often times gods that do descend do so because they are lightning, sun or moon gods that would naturally be associated with the sky. It is no doubt that many gods do indeed dwell in the heavens. It is also true that many gods aren’t associated with heaven at all. There are underworld gods, sea gods, wind gods, Earth gods, etc. To suggest that the story is always the same Daniken must ignore VAST quantities of mythology and choose only bits and pieces to accept as accurate. He must then rob those of their mythical context and impose aliens upon them to see if they “fit”. Daniken admits that he starts with the presupposition of aliens AND THEN looks for proof. This generally isn’t the way science works. Usually you want to collect evidence before coming to a conclusion, not come to a conclusion and then procure the necessary evidence. This section is also filled with lot’s of appeals to the popularity of Daniken’s book. This is a logical fallacy. It’s popularity has no correlation to whether or not it’s true. At 8:29 George Noory is right when he says that people want answers to these ancient mysteries. It’s perfectly understandable for people to want answers. But using aliens to explain away mysteries is just an argument from ignorance, it doesn’t get us any closer to the truth. Planting ideas, the insinuation that the Nazca lines “look like airstrips”. Considering that many of them are pictographs I fail to see how its possible for them to be airstrips. But of course he’s likely referring to the rectangular ones. Why exactly would the aliens land their high-tech interstellar craft on some lines in the dirt? More insinuations soon follow about how it’s an airport despite showing images of the so-called “Airstrips” crisscrossing in ways that would undoubtedly cause collisions or confusion of any aircraft attempting to land. They are sure to label the more down-to-Earth explanations as “disputed” while doing no such thing for the airstrip idea. Dave Childress keeps stressing “WHAT IS THE REASON.” But he apparently refuses to leave the mystery. Yes the Nazca lines are a mystery but that doesn’t mean we insert aliens into that gap in our knowledge. Cargo Cults are the next topic. The issue with this is that physical evidence was left behind by those visiting tribes in airplanes. Crates of goods, airstrips, and other material evidence was left behind that could have been created by the tribes there. So where are the alien artifacts? Where are the tricorders and warp drives left behind by ETs? 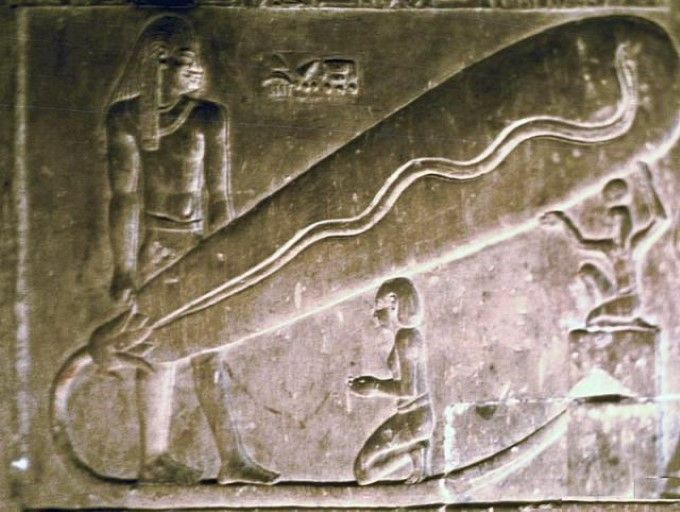 Why are the only so-called “alien” artifacts ones that can be explained as within the capability of the ancients? Stone monuments, pyramids, the Baghdad battery, all point to being man made, not alien made. WHERE IS THE EVIDENCE? We open with Daniken professing that he still has his faith in God, atmospheric music is added. We open with the Ezekiel account. The issues with this are many but I will focus primarily on the description of the creatures in Ezekiel. They are said to have the face of a man, a lion, an ox and an eagle. These seem very specific, even symbolic, not at all the description of horrific alien beings and certainly NOTHING like any aliens reported by modern abductees. They also had hooves, wings and human hands, these are also specifically described as if to be symbolic, not literal. If it is a literal account than this thing is some genetic monstrosity, not an alien. Their faces looked like this: Each of the four had the face of a human being, and on the right side each had the face of a lion, and on the left the face of an ox; each also had the face of an eagle. Such were their faces. The next book we go to is Enoch. Daniken is allowed to assert without challenge that the ANGELS described by Enoch were aliens. He calls Enoch an “eye witness” as if that lends the story credibility as an actual event. People see wild things all the time, eye witness reports do not count as evidence. Of course in this case we’re not just dealing with an eye-witness, we’re dealing with a religious text filled with all sorts of fanciful material such as angels interbreeding with humans to create a race of giants. This is mythology being read as fact and then aliens being added to it for no reason. Our next two speakers are both skeptics, one a Biblical archeologist, one a Professor of Spirituality studies. They point out several good flaws in AAH interpretation of Ezekiel. They are offered only about a minute of time to voice their opinions before we return to the believers. Giorgio Tsoukalos then asserts that religious stories might be “true after all”. What he actually means is the opposite. He’s not proposing that these myths are to be taken in their original context or even LITERALLY, he suggesting they be reinterpreted out of context to uphold AAH. He reinforces this only with the assertion that because writing was rare people would write down things that actually happened to them. They open this section with an image that should instantly cast doubt on the claim that Vimana’s are UFOs. Notice anything from the photo above? How about the horses and elephants and chariots? Does this look like a depiction of a UFO war in the sky? Or does it look like a fanciful mythological tale being retold in artwork? A man then makes some claims about how being made of metal, appearing in two places at one and having a motion similar to a butterfly is CONSISTENT with modern UFO reports. Flight pattern of a butterfly? Well two out of three ain’t bad. David Childress returns at around 29:00 comparing the descriptions of flying machines in Indian mythology to Buck Rogers and Flash Gordon. Funny, I thought he was in favor of AAH not against it. Come to think of it why can’t these descriptions simply be a case of science fiction from ancient times? They follow this up with Giorgio making a few appeals to popularity by pointing out repeatedly that these stories are widely accepted in India. Of course he quotes no pole or statistic and shows no evidence of any kind to reinforce this assertion. Ready for some more desperate attempts to reinterpret things and steal them out of any historical or archeological context? Check out this photo that is apparently flashed up on screen as some kind of physical evidence of aliens. Notice anything about the headdress in the center? Looks like it’s made to appear animal to me. Why are they showing this? Do they think that seriously resembles a space helmet? This image betrays the issue with the vast majority of supposed “astronaut” figurines and paintings. Headdresses were common in tribal times, helmets aren’t a new technology. While the photo above is up George Noory plants the idea of astronauts in the audience’s head never leaving room for it to be anything else. A helmet, a headdress, a halo, the depiction of someone’s head being on fire. The list of plausible possibilities would stretch for miles before aliens would be an option without some other evidence aside from a drawing. What will people who come across superman comic books in 10,000 years say about us, will they claim we could only draw superman because he was real and we must’ve seen him? 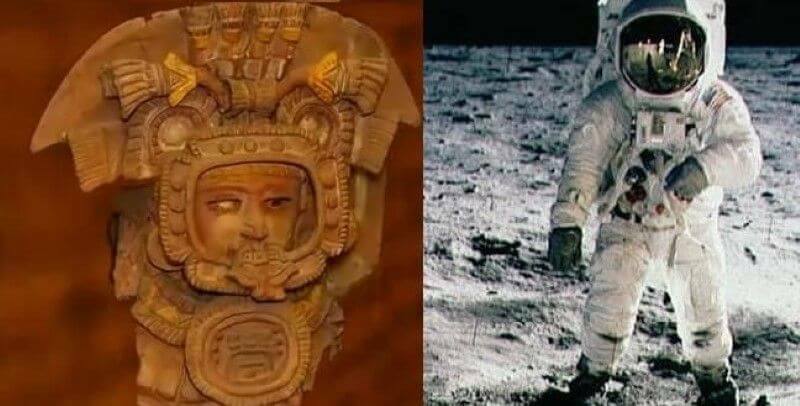 The quite obviously tribal headdress above is labeled as “eerily similar to a modern astronaut”. In what world are these people living in? This thing looks nothing like an astronaut. If it is anything out of the ordinary it looks more like a diving helmet (and even that is WAY pushing it). This has become an iconic artifact amongst AAH proponents. If this is a plane as they suggest where are the engines? Where’s the cockpit? Why are there clearly two EYES? And why exactly does ancient foreknowledge of the plane logically lead one to ALIENS? We humans invented the plane, not aliens, why would we credit them with this artifact? A civilization capable of crossing interstellar space wouldn’t likely have need for such things and according to AAH proponents themselves ancient mythical accounts describe flying saucers NOT airplanes. There is an assertion that the upright tail-fin is not intrinsic to nature. That is, of course, only true if you discount ALL FISH, guess those aren’t part of nature . Even if it were not found on any animals it most certainly could have been created with creative license, the sculptors own creative decision. The idea that this is evidence of aliens is insulting to people’s intelligence. Our one stop is Pacal’s Tomb and I’m honestly still curios as to why this one is so popular amongst ancient astronaut believers. Nothing about this carving looks remotely like an alien craft without stretching the imagination. Of course like most of these things we must first rob it of it’s widely understood historical/cultural context and RE-interpret it (for no reason). When looking at the image in detail the symbolic and widely accepted meaning makes more sense. This is another one that truly baffles me. What does this have to do with aliens? If aliens were helping out Piri in creating the map or in creating the source maps he used why weren’t they flawlessly accurate? Why did they not depict the ENTIRE world? The map clearly shows the tip of South America wrapped around at the bottom often asserted to be Antarctica’s coast. If this were true, for sake of argument, why exactly would this logically lead to aliens? Quite simply there is no link that can be built logically other than by STARTING with the conclusion of aliens and just lumping the map in as possible evidence because its mysterious. So it begins. This is going to be aggravating for me as person after person will no doubt belittle the ancients by claiming they were too stupid to devise ingenious ways to put stones on top of other stones. Even within the first few minutes of this section the narrator himself asks how the Egyptians could have possibly done this on their own. Mysteries, ignorance, does not mean you can insert whatever idea you want. Jason Martell, so called “Alien Investigator” (there’s an official title for you) provides a backhanded compliment claiming that the ancients were strong enough to build these monuments but not smart enough and that some kind of “intervention” was necessary. This sort of thing is very frustrating for me – these baseless assertions made without any sort of evidence at all are far too common in the arguments made for AAH. Martell even go so far as to say “they couldn’t have just come up with it on their own” … WHY NOT? What exactly do the aliens gain from the building of a pyramid? Why spread knowledge about how to build them? Why not spread, oh I don’t know, the cure for cancer? The assertions begin that pyramids are “all over the world” and that means something weird. This is a common and downright stupid claim. It’s like asking why so many cultures built rectangular homes. What we’re dealing with is a fairly simple shape to build in, a pyramid. And contrary to assertions often made by AAH proponents cultures did not all begin building pyramids at around the same time. In fact some pyramids were built after 1 AD while others such as those at Giza are over 2,000 years older. They talk about Teotihuacan for instance and the pyramid of the sun even comparing it to Giza. The Pyramid of the sun was built around 100 AD. The great pyramid was built well over 2,000 years before that. So aliens paused for 2,000 years before passing on the knowledge to the builders at Teotihuacán? Most of this monument section can be glanced over. It’s mostly comparing ancient sites and making the claim that the stones are too big or well placed for humans to do it. Giorgio even goes so far as to say that the site Puma-Punku is the best evidence of AAH available. If that’s the case we can toss out AAH right now. Is Puma-Punku a mystery? YEP. Does that mean we get to call it aliens and walk away? ABSOLUTELY NOT. To do so is just another in a long list of arguments from ignorance. The fallacious logic never seems to cease. A mystery is not evidence of aliens, end of story. We’re about an hour in and we finally get another skeptic, this time an anthropologist named Todd Disotell who correctly points out some of the flaws that I’ve gone over in the AAH claims. Next up is the Antikythera Mechanism. Again I find it strange that this is picked out to SUPPORT AAH when it does no such thing. The device is indeed hi-tech for it’s time but then it’s nowhere near something that would be invented by aliens capable of crossing interstellar space. This is clearly a work of man. The Mechanism was found in Greece, Greece was a well-known scientific center in it’s day. Stories of Archimedes and other inventors inventing some pretty crazy stuff exist in that area. We transition from Antikythera to a well-known Egyptian carving of an plant of some sort misconstrued as a giant light bulb by way of some imaginative Pareidolia. You can even see the quite plant-like stem and leaves just before the “bulb”. Giorgio claims that this carving is in an area that no one was allowed into, a secret room, yet he then claims that lightbulbs were a tool used to light the tombs as they carved. Even if, for sake of argument, we accept these as lightbulbs how in the hell does one get from lightbulbs to ALIENS? What sort of jump of logic is that? The Baghdad Battery is up next. This, as per usual, has zero to do with aliens. It’s an interesting discovery if indeed it is intended as a battery but it’s clearly an ancient homegrown design, not something imparted from beyond the stars. Honestly how any of this manages to convince anyone of aliens astounds me. Is there a reason the ancients couldn’t have developed this on their own? Eventually a skeptic comes up and says what all critical thinkers are probably screaming at their TVs “we shouldn’t think of the ancient people as dummies!” The narrator soon asks the audience why the ancients were so obsessed with the sky? Well put yourself in their shoes for half a second, strip away all knowledge you have of astronomy. If you were entirely ignorant of what you were looking up at you would marvel at it too. Hell people still marvel at the beauty of the sky today, amateur astronomy is a fairly popular hobby and we know what we’re looking at better than the ancients did. The show wraps up with Giorgio pretending that skeptics have the burden of proof, that we have to prove him wrong in order for him to set aside AAH. The ones making the claim hold the burden of proof. The skeptics do not need to show evidence that you are wrong. AAH doesn’t need to be debunked, it certainly helps but it’s not necessary. To quote Sagan, extraordinary claims require extraordinary evidence. The lapses in logic and the fallacious reasoning used by AAH proponents should really say it all. The fact that the vast majority of their so-called evidence is actually explainable better with human ingenuity and mythology also speaks volumes on the subject. In the end ancient aliens are another argument from ignorance like a God used to fill gaps and mysteries in our past. There simply is no reason to believe in ancient aliens. Although we cannot rule out the possibility of alien visitation without conclusive evidence of it there simply is no reason to believe. I say it is better to leave ancient mysteries a mystery until a real answer can be found.